Food52 members' favorite 10 recipes: Cilantro chutney (Lilli chatni), Green beans with mustard seeds and ginger (Fansi nu saak), Cauliflower, cashew, pea, and coconut curry (Phool kobi kaju anna mattar nu shaak), The perfect basmati rice, Naan, Worker’s curry (Chana masala), Chaat salad, Chili paneer, The perfect masala chai, Roasted cauliflower with cumin, turmeric, and lemon (Masala phool kobi). We made the filling to stuff into some leftover empanada dough, so we haven't tested the pastry. Peas are surprisingly difficult to mash with a potato masher so it is worth getting out the food processor. We didn't have access to ours (moving) so I had to use a masher and it was hard work and we still ended up with lots of whole peas in the mix. The mix was a bit dry and I ended up adding a bit of water to pull it together. I suspect this might not be necessary if the mixture is fully pureed in a food processor. It was a little heavy on the cinnamon so I reduced it from 1.25 tsp to 1, and I can't decide if it was just right or still too much. Maybe increase the garam masala by .25 next time and see if that is the right balance. (This may depend on the freshness of the cinnamon. Ours was brand new.) I will say the cinnamon scent attracted my 5 year old and she devoured 2, even though they were quite spicy! 4.5 star filling but not giving it a rating since we didn't try the pastry. Made again, this time, the full recipe. Like her momo's recipe, her math is off when it comes filling the dumplings. She says to use a tsp, but even a heaping tsp weighs only 6 grams. The full filling weighed almost 600 grams so if you followed her instructions, you would have enough filling for nearly 100 kachori. (Note the recipe is only supposed to make 25 kachori.) I tried to fit as much as I could, and I rolled the dough thin to get a few extra dumplings, and I still had filling leftover. Baked for about 26 minutes. The kachori had no color on the top, but the bottoms were browned. I had put the thicker, pinched together side on the bottom, so those browned thick bits were a bit too tough. Tops were fine, not super attractive though. I think these just aren't great baked, as much as we want them to be. Might try again and fry them. This was so delicious, though I slightly overcooked a few sides on my first batch of paneer, I had an easier time getting it well colored when it was closer to medium heat. The flavor was perfect, I might try it without the chili next time (and maybe just a small sprinkling of chili flakes) so that the kids will be able to enjoy it as well. This is delicious! Like the other reviewer, I burned the first batch of paneer but it was still good (just a bit crunchy). I only used 1/3 of a jalapeno (seeded) instead of a chili, hoping it would be mild enough for my kids to eat and it wasn't hot at all. Next time I am tempted to add a bit more tomato paste so there is more sauce, because it was so delicious. SO delicious. And easy! I went ahead and did the technique of charring the cobs over a stove burner, which was pretty fun. I wrapped each ear in foil and drizzled the butter into the foil package, which kept if from spilling everywhere and helped evenly coat the corn. The chile garlic butter is delicious, and the sprinkle of salt and lime juice really take these over the top. Also, the flavors aren't overtly Indian; you could serve these with anything. Really tasty, easy recipe. I'll be making this again and again. The flavor combination is delicious - flavorful, but not too spicy. I let the chicken marinate all day, so it was also beautifully tender. You could probably cook it a little faster by increasing the heat in the oven or cooking it under the broiler, which also would give it a nice bit of char. We enjoyed it with naan, mint chutney, and salad. This recipe is a favorite of ours--I've made it three or four times and it's delicious every time. The chicken stays really moist from the yogurt marinade, and the spice combo is just delicious. I think it's better than Madhur Jaffrey's version in Indian Cooking, and it's also easier--a win-win! Oh, these are tasty. S, who is sloooowly warming up to fish, said "you know, this batter would also be great with chicken"...as he helped himself to thirds. The recipe says to bake for 12-15 minutes but mine were done after 9 so do carefully check especially if you have some smaller fish pieces in the mix. Beautiful flavor, reasonably easy, and store surprisingly well. Can I tell you something kind of trashy, but great? We made these with the spring cabbage recipe in the book and had planned to also do the Gujarati pancakes, but then got lazy and realized we had corn tortillas in the fridge. So we whipped up a quick yogurt sauce, chopped up a little cilantro, busted out the hot sauce, and made deshi tacos instead. I packed some up for the next day and honestly, "not-sad desk lunch" doesn't even do it justice; "fucken lit desk lunch" is more like it. My coworkers were so jealous. And curious: Meera Sodha sold at least three more copies of her book today, and damn, did she earn it. I agree with Zosia that this recipe has potential. We thought there is some tweaking needed on the spice balance, but it wasn't bad. I used cod and served it with masala fries as suggested. We liked the crispy coating on the fish. Also wasn't convinced that the lemon rind contributed substantially to the taste. I served the fingers with mango chutney which worked well and a side of sprouted greens with poppyseed honey dressing and roasted almonds. Not everyone was a fan of the spice blend but this method produced a crisp breading without frying. I'll definitely make it again but with modifications to the spice mixture. Deeply flavored and extremely satisfying. Served with the date and tamarind chutney (Serious Eats' tamarind chutney is also quite good with this, if you don't have dates on hand). I didn't have any problems with them absorbing much oil. Easy to make and tasty though absorbed a lot of oil on frying. 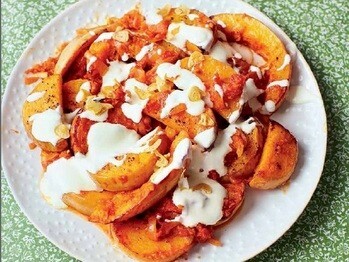 Delish with mint and yoghurt sauce from the same book and some grated carrot with ginger. Agree that these are delicious (although they are definitely best when fresh and don't reheat very well). We enjoyed them with a storebought spicy mango chutney, but I'd love to try them with the date and tamarind chutney from the book next time. Delicious, simple way to prepare scallops. Nice flavor that still allows the sweetness of the scallops to shine. This is a great appetizer: sweet with a hint of spice. I shared with an Indonesian friend, and we both loved it. Outstanding recipe. I had worried that the tamarind and garlic would overpower the scallops- not at all, instead they compliment the delicate flavour of the scallops and bring out the best of it. I’ll make this again and again. Beautiful recipe- I'll make this again and again. I have wanted to try this recipe for a while since the filling looked interesting and it uses filo pastry which I had not used for samosas. The beet filling was easy to make and very tasty. I tried a few at the size recommended (she has you cut the filo 4 inches wide) but I just found that too big. For me the filling to pastry ratio was off so I made mine quite a bit smaller and that resulted in a better product I thought. I'm glad I made a few test samosas since I found that they lose their crispness quite quickly. To make them for guests I froze them overnight and cooked from frozen as directed. Everyone liked them. They are quite fiddly to make so be sure to have a good block of time available to make these. I will probably make again since I've got lots of filo left over. As an update to my previous note, I would add that I did freeze the leftover filling in small servings. Later, just heated with no pastry, the beets and feta mixture makes a tasty veg side dish or lunch dish. Will probably just do the filling again since it's so good. This is one of my favourite recipes - I have made it many times. When I first tasted this filling, I thought the flavor was too harsh. But I have to say, once it is wrapped up into a samosa, it's perfect! The butter filo wrapping contrasts the spicy acidity of this filling perfectly. What a win. We ended up with a little extra filling which my boyfriend ate over rice for lunch, and he said that was delicious as well. Fantastic flavour, though not very spicy (hot) because of the chili powder and pepper I used. They were particularly good with the sweet and hot tomato chutney. I decided to make this filling to serve over rice, rather than in samosa form. The flavor is really nice! It wasn't quite strongly flavored enough to stand being mixed up with rice, but that's my fault, not the recipe's. I'm sure it would be lovely in a samosa, with some sort of flavorful chutney to set it off. These turned into kind of a mess trying to fill the phyllo, but that's my fault for trying to use some super old phyllo that I had in my freezer. I also wasn't totally clear what she meant by "making a cone" to stuff the lamb into. In any event, these had good flavor and probably would have been even better with a nice chutney or some kind of dipping sauce. Would probably try them again with some new phyllo. I enjoyed it but found it a bit too heavy on the coriander. My first Indian curry! The recipe made good use of my leftover aubergine, onions and tomatoes. I'm not a fan of cumin or turmeric, which plays a huge role here, so I can't say I'll make this dish again. But I love the idea of reducing the aubergine, onions and tomatoes till it's almost a stew. This is nice but the best Aubergine curry is the Lake Palace Hotel recipe in the first Madhur Jaffrey' book. I really liked this curry. It reminded me of an Indian ratatouille. Easy to pull together. Definitely will make again. Quite a delicious vegetarian curry that comes together in a pinch. Great way to use all those scraps in your vegetable bin. I also add cubed tofu or chick peas and sometimes spinach. Lovely curry- fast, flavourful and easy. Another lovely curry. I served it with turmeric fish from Bill Granger's Everyday Asian and rice. This was very tasty. I didn't like the idea of butternut squash pieces with the skin left on, so I cubed the squash and roasted it for approximately 20 minutes. Very easy and delicious recipe. My SO objected to the skin left on, otherwise it was pretty solid. Top honors in the family go to Jerusalem roasted squash recipe with tahini sauce. Nice dish. Would make a good side with roasted lamb. Chiming in to say that I agree with Rutabaga and Tealismyname that this is better off as an accompaniment and not a main. Very good as written, though next time I might up the tamarind a bit. 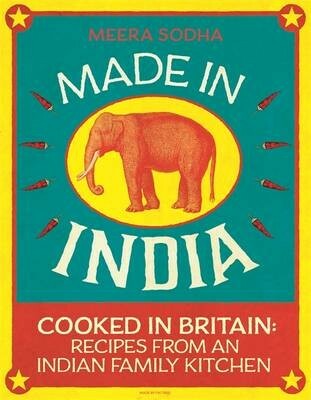 Worked well with some paratha, rice, raita, and the Cauliflower, Cashew, Pea, and Coconut Curry also from this book. I was prepared to love this one, but sadly I didn't. It was nice enough - I liked the taste, but the texture was what let it down. It's very, very soft and mushy. I served it with rice (for me) and Naan bread for my non-celiac husband and he definitely enjoyed it more than I did. The rice and the mush got to be very monotonous after six or seven mouthfuls and I desperately wanted some variation in texture. I'm glad I tried it, but I can safely say I won't be peeling 100 cloves of garlic again in a hurry!! Having recently purchased a very large bag of peeled garlic cloves, this seemed like the perfect recipe to try. In fact, I doubled it and made 200 garlic-clove curry! My husband and I both loved the flavor - very garlicky, but with dark caramel undertones, nicely balanced by the mustard seeds, cumin, coconut milk, and hint of tamarind. My five-year-old enjoyed the sauce, but found the actual garlic cloves too strong. I served it alongside naan with the chickpea workers' curry, and found those flavors and textures to be a good match. Delicious as it is, I don't think this should be served on its own as a main dish. It took a little longer than Sodha suggested for me to fully cook the garlic, probably about 30 minutes after I put the lid on the pan. Comforting bowl of spiced potatoes. Not a masterpiece but comes together quickly and is quite good on rice. Better with ghee, comes out richer. I love the combination of potatoes and Indian spices but wasn't crazy about this particular curry. Absolutely nothing wrong with this dish but we weren't wowed by it and there are so many amazing Indian ways to prepare potatoes so I doubt we will revisit this one. Excellent flavour combination. The whole family loved it despite their initial concern over the absence of meat. I'm really looking forward to the leftovers. Loving this book! I really liked this curry, although I agree that it was fairly mild. I routinely "over" estimate my ginger and garlic, so it was fine in that sense, but it wasn't spicy at all. Good, though, for the 3-yr old gremlin who actually ate his "white broccoli" and peas with genuine abandon. My husband and I added a spicy and crunchy chile garlic sauce on the side and that worked perfectly for us. 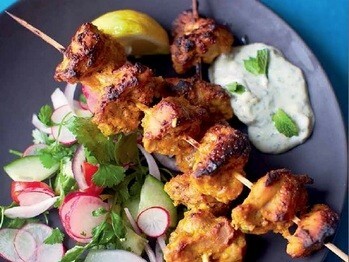 Definitely will go into the rotation, though, as it's kid-friendly Indian and really quite easy to make on a weeknight. This doubled well. Everyone enjoyed it in a group of mixed omnivores and vegetarians, including some who are unfamiliar with Indian food. The flavor was mild and sweet but that meant it paired well with our more spicy entree. This was good, but next time I will increase the amount of garlic and ginger, as I felt the flavors were a little mild. For our four-year-old's sake, I was happy it didn't turn out spicy (I used a seeded red chile), but all of us can handle a little more garlic and chile in our food. Salting the cauliflower when the coconut milk is added rather than later would also help, and I would make the cauliflower florets quite small for faster cooking. This would be a good curry to make in advance, just wait to add the peas when you are reheating it. It's not too saucy, and is one of the first curries my son has actually eaten of his own free will. I agree with Rutabaga- the flavors were very mild. Granted, I forgot to buy a chile but upped the garlic and ginger and chile powder (for me it seemed like a lot). I think two things toned down the dish- the coconut milk and the cooking with the lid on. Next time I would add only the coconut cream, up the spices and cook it longer with the lid off. I thought the sauce was too watery. After reading clkandel's recent comments and needing to use up languishing cauliflower, I gave this vegan recipe a try. We liked it and I can see making this again, but with additions. I would add handfuls of spinach at the last minute for more color and taste and sprinkling of fried onions or fried garlic along with cashews, cilantro and lemon juice. I followed the recipe except I added some edamame as well. The taste is mild but this can be made hotter with more green chili. For us, the hotness was about right but I did think that overall taste was little muted so that squeeze of lemon right before serving is important. Served with basmati rice. Overall, very good recipe. Photo added. I liked this curry a lot. The flavors are very subtle and its great to have another vegan curry to go to. I might try it with a little more ginger, garlic, and chili in the future. It makes 4 pretty big servings. With rice it is quite a filling dish. This dish is delicious. Flavors blend great, heat can be adjusted with amount of pepper & seeds. I added more peas and coconut milk. I made this and had to use chaat masala instead of garam masala and that made it taste a little sour. Otherwise, this dish is ok - I too would increase the ginger and garlic. We also enjoyed this dish - served with rice for a tasty midweek dinner. I made it with frozen cauliflower and frozen peas, making this a easy store cupboard/freezer meal. I loved a similar curry from Prashad. But it is very spicy so I haven't cooked it since having children. I'm so glad this one is mild but yet still very flavourful. I liked this even though I had to make some changes (mostly reducing the spices, and also I was short on ginger and out of cilantro). My kids didn't like it at all. Also I followed directions to use two onions and I felt it was too oniony. One large American onion would have been enough. Still it was good and would have been better if made as written (though IMO with less onion). Fantastic, richly flavored. Easy to make, only requires two pans. Freezes well. Will make again! This was pretty good, although a little bland on its own, I thought. Adding some spicy lime pickle really livened it up! If you can take the heat, I recommend adding some; it was excellent here. I'm curious as to how the flavors will develop in the leftovers, as so often the flavor of Indian dishes deepen with a little time, and we did have a lot leftover. Maybe my vegetables were on the large side, but I'd say this is easily six servings. It would also be good with the sour cream dressing from the Vij's at Home cookbook. I liked this, but don’t see it as the indulgent, buttery street food described by the author. I thought the white bread roll serving muted the flavours and, texturally, made you miss something chewy or crunchy or meaty, presumably contra the intention of a vegetarian dish. Maybe I just crave seared beef with white buns. Will benefit from slight undercooking, otherwise it can turn mushy, especially on reheating. Agree that lemon is crucial here - might also consider pickling the red onion for extra sharpness. I made this with tofu for a dinner with a non-dairy eater. Dried the tofu on paper towels for about an hour, then fried until starting to get brown and crispy. Worked well - delicious! Delicious and hearty. Could use some heat maybe. I whip this up quite frequently when I'm craving something quick. I make the child-garlic-ginger paste (either frozen in cubes or in a jar with vinegar or lemon to preserve it). I usually make my own paneer but in a pinch I buy it and the meal comes together in a snap! Also, I don't always include the tomatoes. I made this as a side to Mum's Chicken Curry. Had I known I would be using the same garlic, ginger, chile paste... it took much longer than 15 minutes to caramelize the onions so I blasted the okra in the oven which is my preference anyway to make it crispy. Skipped the hot yogurt sauce and it was just like our favorite dish at the neighborhood haunt. I made a few changes to this salad--I chose to serve it cold rather than warm, and subbed raw arugula for wilted spinach. What I did was caramelize the onions for a long time with the chickpeas, roast the vegetables, and then allow both of those components to cool before mixing them together in a big bowl. Then I added in the yogurt chutney and peanuts and let it all mellow in the fridge for a bit before stirring in a ton of raw arugula. I did not serve this salad with papadums--we had it as an accompaniment to butter chicken and naan instead. This was not my favorite dish at dinner (how could it be when there was butter chicken at the table? ), but I had some leftovers cold for lunch today with more arugula mixed in, and thoroughly enjoyed them. Since I am not a fan of cooked greens, this solution turned the salad into something I would really enjoy, and I would make it again like this. Do note that this recipe makes a TON of salad. The flavors in this dish really meld well after the slow cooking. While the cooking time means this isn't a particularly fast dish, it's still pretty easy to put together. I used cherry tomatoes, and also found that I only needed two red peppers to equal one pound. I took about 7-10 minutes to sauté the paneer, so I recommend starting that task about ten minutes before you expect the peppers to be done to help keep the cheese from cooling down too much. This was a really nice dish. The paneer does take a while to brown, but it is so tasty! I used a mix of bell peppers and Jimmy Nardello peppers but I would stick to bell peppers next time as the skin on the Jimmy Nardello peppers stayed quite firm, which wasn't pleasant in the curry. I used a mix of fresh peppers and jarred roasted peppers - also, did not use cumin and coriander seeds but rather ground, which I added to the sauteeing peppers and onions. The paneer cubes took a while to brown, I doubled the recipe so had to do in several batches. Served over Basmati rice - nice flavors, even better reheated the next day. I really liked the peppers but the paneer didn't really seem to work with the dish. I've never had paneer before so I don't know what it's supposed to be like, but this paneer was totally devoid of taste ... it simply provided a very bland textural contrast to the peppers. Ended up picking the paneer out of the curry. I'd make the pepper curry again though. This was a fun new way to use really ripe tomatoes. As a dish, it can stand on its own, but is also good mixed with other less acidic dishes, such as the chana dal recipe from this book. The spices do a good job of enhancing the tomatoes without overwhelming them. The spicing in this is fairly subtle and it is a nice change of pace for asparagus. I used sugar snaps rather than green beans and snow peas. Wonderful, easy, fresh flavored. Will need to try it in tacos with the honey tamarind chicken. We ate it with the pav bhaji and the aloo tikki from this book. Really easy but flavorful side. Inspired by urmami's comment below, we piled this cabbage into tacos along with the honey tamarind chicken from this book. The combination was insanely good, and will be repeated. Finally a recipe that uses an entire head of cabbage! This is cheap, easy, and even the picky eaters liked it. Aahh, this cabbage recipe is beautiful. I don't have anything constructive to add except that it's perfect piled on top of the Royal Bengal fish fingers (in the same book) and napped with a little yogurt sauce, cilantro, and drops or even drizzles of hot sauce on top. Warm corn tortilla wrapping optional, but I think we as a society really need to get with the concept that tacos and Indian food can be buds. It's also great snacking by itself, and will be a treasured side for years to come, I just know it. And of course so, so easy. Delicious twist on roast chicken. I expected the Indian flavor to be much more pronounced given the quantity of spices (and toasted and freshly ground to boot), but in fact it ended up quite subtle and mellow. That's not necessarily a bad thing, though -- we still enjoyed very much and I'll make it again when I want a variation from basic plain roast chicken. I served with some roasted fingerling potatoes and simply sauteed kale, and it was great. The only thing I would change next time is to place the chicken on a roasting rack -- the author doesn't mention using one so I didn't, but I think it would help crisp up the skin underneath. Delicious! That being said, I made sort of a technical error--I didn't grind the almonds, garlic or onions up nearly as finely as I should have, and as a result the mixture was a bit chunky and didn't adhere well everywhere. My chicken looked nowhere near as picture-perfect as the cookbook image because of this. At any rate, the flavor was great, which is what matters. I made this last night and as we had friends over I doubled up the recipe and roasted two chickens. I marinated them a good 24 hours (much longer than stated) and they were perfect. I loved the almond spice yogurt marinade, and the meat was so tender and moist. I served them with the Ferrari potatoes as suggested and the green beans from the same book. Given the amount of spice, I was surprised by how bland we found this, despite marinating for 6 hours. It was improved by the book’s “Chaat salad” as an accompaniment, but not enough to warrant a repeat outing. The technique of rubbing the yogurt spice mixture between the skin and the breast resulted in a very moist and delicious chicken breast. I didn't love the spice blend as it had a bit too much cinnamon for my taste, so would like to tweak it a bit. I thought this was fine, but I probably wouldn't make it again. The spice blend didn't do that much for me either. (I had marinated the chicken at least 4 hours before roasting it.) I served this with the Ferrari potatoes and I didn't like the combination. It tasted too dry together in my opinion (though I really liked the potatoes). Agree that this is another great-tasting curry from this book. I made it a few days ahead to no seemingly ill effect. This is the right dish to pick if you are cooking for the spice/heat-adverse. A sweet and mild tasting curry. The children and I all thought this is delicious. Mr lilham however thought it was too sweet and preferred the pistachio korma from the same book. (I think this and the korma are both perfect for those who can't handle heat). good flavor but a bit mild and sweet - I added a diced green chile for some heat. I will add an additional chile to perk it up next time. This was super easy and quite good, even though I had to use nonfat yogurt (next time use full fat!) and I used too much chili powder (mine is too spicy!) Also, I've discovered that I don't like the stringy texture of sliced onions in these curries, so next time I'm going to chop them. Delicious mild flavour. I missed the extra heat, but seeing how much the child enjoyed it and she asked for seconds made me forget about it. The leftovers made a delicious lunch today. We loved this curry and combination of spices. I may have added more ginger than directed as it had a lovely tang (not bland as someone else experienced). I used pork tenderloin in place of chicken and green tomatoes from my garden. We will have this one again! I thought this was a little bland. The are nicer chicken curries in this book - Mum's is my favourite. Made this on St Patrick's Day. Well, the pistachios are green, I guess! Anyway, we all thought this was a keeper. Sammy really liked the chicken, although she didn't eat all of the onions in the sauce, but that's just her. I did take the time to get them nice and deeply caramelized. As the other reviewers mentioned, it's not spicy, but I don't think it was bland. This is a good curry for kids or the unadventurous eater, but that doesn't mean it's boring. Paired with coconut rice. Will make again. This is surprising Indian curry in that it is not spicy-hot, but still flavorful. Phenomenal. Rich and balanced, great consistency to the sauce. Needs loads more salt then the recipe calls for, but easily corrected before serving. The pistachios lent this curry a nice richness without any cream. It would be a good vegan dish if made with vegetables in place of chicken; jackfruit might be nice. I liked the warm, rich spices that gave it a more subtle flavor than some curries. My six-year-old usually won't eat curry, but he ate some of this one without complaint. Personally, I didn't find it bland. In fact, I think the flavors are fairly sophisticated, but you may want to increase the spice amounts if you like more oomph or if your spices are old. Since it's wintertime, I used a can of whole Cento tomatoes, together with their sauce, in place of fresh ones. I had doubled the recipe, and a 28 ounce can of tomatoes was perfect. Instead of cubing the chicken prior to cooking, I added the whole boneless skinless thighs to the pan, then shredded it after it was fully cooked. We did not think this bland either. Used labneh instead of greek yogurt to good effect. Upped the garlic a tad. Lovely korma. Not spicy so it's good for young children. We loved this curry. I did freshly grind my cardamom seeds- I'm not sure if that made a difference in flavor. I also didn't serve it the day I made it but two days later, which usually improves the flavor. Since caramelizing onions is the step that takes the longest for this otherwise fairly easy curry, I just started that right away as the first step and got the onions going while I took care of the ginger/garlic paste and pulling together the other ingredients. I used gochugaru as the chili powder and it was a good level of heat for this type of dish. Possibly my new favorite recipe from this book (and there are plenty to choose from). The salad portion really makes this dish. It is perfectly balanced (I decreased the salt), and tastes so good with the garlicky chicken (I used boneless, skinless, thighs). Will be repeated frequently this summer. This is one of those dishes that feels like more than the sum of its parts. Each component - the chicken, the salad - is pretty straightforward and not what comes to mind when I think of traditional Indian food. The chaat masala in the dressing brought it all together and the salad was nice and light. I didn't have papadums but I did have freshly made garlic naan my local Indian market. The whole dish was delicious. Another amazing recipe from this book. Can't believe I hadn't tried it yet! We used a mix of drumsticks and chicken thighs. Next time I'd go ahead and use boneless skinless ones, because with this cooking method the skin isn't going to get crispy anyway. I will note our chicken threw off a lot more liquid than shown in the cookbook picture--after all, there is oil, butter, and chicken juices brewing in the covered pan. I might want to do a quick, uncovered sear on the chicken before serving to help this issue next time. We didn't have papadums so I just served crackers on the side, and while inauthentic, it was nice to have a crunchy bite. The salad part of this recipe is phenomenal. The chaat masala works perfectly here. I would consider making the salad on its own, or upping the dressing a bit and mixing in leftover shredded chicken. That'd make an amazing leftovers lunch. This will be repeated! Wow, we REALLY loved this recipe. The sweet/sour/spicy flavor is reminiscent of a really delicious barbecue sauce. We used boneless skinless chicken thighs, and followed the recipe as directed, except we put the thighs under the broiler for the last few minutes so that they'd get more caramelized. To serve, we shredded the thighs, spooned the extra pan juices over them, and served them in tacos with some spiced cabbage (also from this book) on top. It's a little tacky to make Indian tacos, but seriously, the result was to die for. I would not hesitate to do that again. This recipe will be repeated. Family loved this! And I loved that it was so easy yet so flavourful. The chili powder here is a blend that has a Tex-Mex flavour and no heat so I used hot Hungarian paprika. Delicious! This is delicious and so simple to pull together. I ended up using chipotle as the chile powder, which with the honey and tamarind gave it a much more Mexican than Indian-flavor profile. I think that shows just how versatile this recipe can be. I had joints with thigh and leg combined, so had to add about another 20 minutes of cook time for the chicken to cook through. Easy to make and very tasty. It disappeared very quickly! I served it, as recommended, with the mint and yoghurt chutney recipe from the same book. This is a favorite curry for us. I don't bother frying onions as a garnish at the end; if anything, I'd use some crispy packaged onions, but I don't find it necessary. Both times I made this, I used storebought coriander chutney from the Indian market near me, and it turned out great. I have also made the coriander chutney from this book, and it's delicious, so I'm sure this curry would only be improved with the homemade chutney. Great curry recipe! I made it over the weekend when I had more time and reheated it during the week for a delicious,quick meal. I used boneless thighs which I'll cut into smaller pieces next time so the meat can absorb more of the amazing flavours. As others have mentioned it is mild, my 8yr old devoured it and asked for more. I've ordered the book and am looking forward to more delicious meals. Everyone enjoyed this dish, and as the chef I was pleased with how simple it was. Simple enough to be a weeknight dish and it felt fresh and healthy. I used chicken thighs that had the bone and skin, but in the future I would use boneless because everyone seemed to remove their skins. Quite simply one of the nicest chicken curries I have ever made and eaten. A firm favourite. This was a wonderful curry. Subtle, which is what I like. I used bone in chicken thighs, which meant I had to skim the fat off. Then I shredded the meat. I also left out the almonds (lazy!). Definitely will make this again. M made this for dinner using left boneless skinless thighs that he left whole. Very tasty and warming. Notes for next time: cut chicken into pieces, add more chile, and don't worry if you don't have ground almonds because they don't seem to add much. Delicious. I used veal in place of chicken. So easy and so tasty. Will make this again. I can only repeat what everyone else already mentioned, this curry is exceptional! The kids even wanted an additional bowl of rice just with sauce, which is the true star of this recipe. Used boneless, skinless chicken thighs which made it a real weeknight friendly recipe. Agree with others that this is one of the best curries I've ever eaten. This is in my regular rotation and I've made it again and again. Just as wonderful as everyone says. The sauce is very flavorful and rich-tasting. I agree this is by far the best chicken curry that I have ever made. Everyone here was exactly right. This is a wonderful curry. Everyone came back for thirds! I made it with boneless , skinless thighs and I cut them into bite-size pieces before cooking. Not a hard recipe to make, but lots of complex flavors. Next time I'll try for a bit more heat. I used two fat jalapenos but I seeded them, and that was probably a mistake. Served with store bought naan and a quick cucumber raita. Also, you could make the sauce in the afternoon or the night before and then add the chicken 1/2 hour before dinner is served. That way it would be a very easy weeknight meal. Again, great recipe. Comforting. Made with boneless chicken thighs. Some spice, little heat. Chopped fresh cilantro a nice addition. Very fresh flavor. Pretty easy for a week night. Recommended. Like everyone else, I really liked this. I used boneless skinless thighs cut into pieces. I made most of the sauce ahead of time and added the chicken on the night of. However, I found that the curry improved with an overnight rest, so in future I would make it entirely in advance and just reheat for a quick weeknight dinner. I don't usually like leftover chicken thighs but these were great. Both kids refused to touch it. However with the leftovers E tried and liked it. Fantastic flavour for very little effort. I second blintz's comment about making the sauce in advance and just adding the chicken 30 minutes before you want to serve the meal - makes it a really easy weeknight dinner. Next time I will go for a hotter chilli as I like my curries with a bit more heat to them but otherwise it's a really nice curry and I will definitely make it again. Joining the chorus of praise for this curry. I used quartered chicken thighs and skipped the ground almonds. Served with rice, cucumber / yoghurt raita and steamed veg. Another note in the chorus of praises- very complex tasting sauce without hundreds of spices. I used bone in thighs but I felt the sauce needed extra cooking time to break down the onions anyway. OK, I finally made this curry, and like the others, I agree that it is very good, especially considering it seems so "basic" on the surface. For my dish, I used chicken drumsticks and a couple of boneless, skinless chicken thighs. My husband prefers boneless meat, but I think the bones really help with the flavor here, so if I have time I would like to try it with chicken legs in the future, then remove the meat from the bones before serving it. But even boneless, skinless thighs would still doubtlessly be delicious. This was delicious and I really liked that it used whole chicken thighs as that saved prep time. She calls for 800g of boneless, skinless thighs and I only used about 600g. I thought that amount was fine. This is a good weeknight dish. Like other reviewers, I thought this was wonderful tasting curry without having all kinds of herbs/spices that often defeats my attempt in making some of the Indian based recipes. The author uses spices often found in well-equipped American kitchen ie cumin powder, whole cumin, turmeric, cinnamon sticks, and garam masala. I'm still not sure what tomato passata is so used what I had on hand which was equal amount of tomato pesto (basically very concentrated tomato sauce) and 2 cut up fresh tomatoes. I also added 4 handful of fresh spinach leaves at the end and cooked for 3-4 min. I did cook the sauce much longer than the recipe - about 2 1/2 hours (very low simmer) with cover on and found it perfectly cooked. Although I used skinless/boneless chicken thighs I think this would also be good using paneer or tofu pieces. I will join the chorus to sing the praise for this curry. Simple and yet have complex flavor. The only thing I'll do different is to break the chicken leg quarters into thighs and legs, so the curry flavor can penetrate into the pieces more or cook it in the instant pot. Oh yes, this was as good as they say, absolutely delicious! Nowhere near as hard as I thought a curry would be. My sauce wasn't as vibrant as the photo but I might have added a little too much yoghurt. Quite a delicious, unique curry. I used cubed chicken breast (boneless, skinless) in place of quail, and cooked, roughly chopped chick peas from my freezer in place of tinned chick peas. Another curry from this book that comes together very quickly! Would make this again. I served this with scented cinnamon rice as the author suggested. Delicious, and easy to prepare. Definitely worth preparing the day before as the author suggests. These kebabs are delicious! I used "lamb stew meat" which I feared would be too tough, so I brined the meat overnight. We then proceeded to marinate the kebabs for 3-4 hours before cooking. Served with garlic raita, naan, and a salad, this was a very satisfying dinner. Raita is a must with these. These were excellent, I used half a jalapeño for the green chilli so the child would enjoy it too. I made the suggested spicy tomato chutney and masala chips/fries. 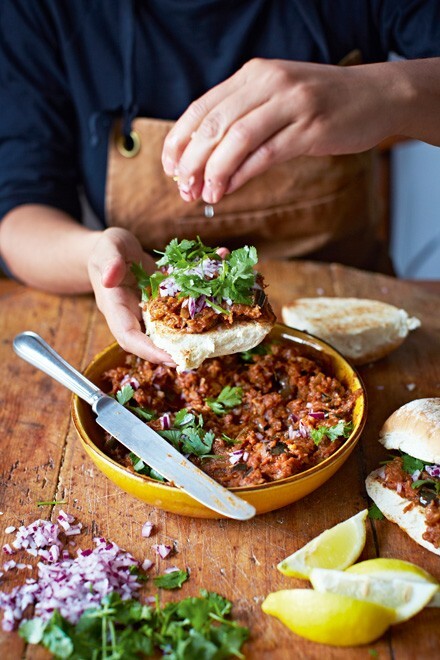 I usually make Jamie Oliver's Moroccan lamb burgers but these are my new favourites. Best meal I've had in a long time! Yum--easy and delicious. Served with the baked masala fries and tomato chutney as suggested. Phenomenal. With the tomato chutney, red onions, and a slather of mayo, we were in heaven. I might decrease the amount of chopped onion in the burger next time, but otherwise, these are perfection. Will be repeated. These burgers were amazing, maybe the best I have made. I served them with the tomato chutney suggested, as well as the masala fries and date and tamarind chutney. Both chutneys slathered on made this quite the treat. I am excited to make these for guests. So good. Will make it often. No green chilli so used red but everything else as written. Very nice - my family loved these especially with the chutney as suggested. These are good, although I substituted ground turkey and used less pepper (to accommodate my six-year-old), so they weren't as rich or spicy as they would normally be. Very tasty! I used a pound of lamb rather than 14 oz and split the mix into 8 burgers rather than 4. Served with the tomato chutney. Will definitely make again. This recipe also works well with ground beef. These were just great. I used a whole serrano chile with seeds and that was spicy but not too much. The chile reduces any gaminess from the lamb. Would like to try this with bison meat for a lighter option. Great flavour, despite having minimal marinating time - looking forward to repeating and increasing the wait. I used about 250 ml water and skipped serving the sauce. The meat was tender and falling apart. Served with the suggested cauliflower and naan dishes, and a yoghurt / grated cucumber dish, which worked really well. Wonderful flavour and very easy to prepare. This is aromatic and pairs beautifully with the suggested naans and kachumber. I served the cauliflower suggested which is a fabulous recipe, but I thought with this dish, competes against the flavours of the lamb and kachumber. Halved this to feed four, using two lamb shoulder steaks cubed. Absolutely delicious. As always with Meera Sodha the spicing is delicate and balanced, and the cooking times spot on. This is far better than any biryani I’ve been served by a takeaway. This was nice but didn't blow me away. Maybe the curry leaves aren't optional? I used 2 green chillies in the paste but ended up adding a small, hot red chilli as well. I'll try it again because it's a simple weeknight dish, but only when I can get the curry leaves. I can see this becoming a regular dinner in this household. Absolutely delicious and it's good for an evening when you're not sure exactly when you're serving dinner; I made the sauce a few hours in advance and then just heated it up and cooked the fish in it quickly when we were ready for dinner. We thought this was good, although our jalapeño was too mild (even using the seeds) and I could have used more heat. (I used gochugaru for the chile powder.) I liked the acidity from the tomato and lime cutting through the richness of the coconut milk. We did have curry leaves (picked from our plant, so they were quite young and mild) and they did add a certain something to this dish, as they usually do. I would recommend including them if you can get them. Have made this twice with cod - excellent! Leftovers ( I doubled the recipe) froze well - nice treat to pull from the freezer! The whole family loved this. I put less chili in because of the kids but it was still fantastic. We made this with cod and served with both rice and naan, and it made a lovely weeknight meal. I found the sauce to be a bit onion-heavy, but to be fair I'm positive our onions were larger than what you'd find in the UK. Next time I might decrease to one onion or at least let them caramelize and cook down a bit longer. I also left the lid off once the fish was added, since the curry was seeming a bit watery to me. I think the extra time to reduce down helped the sauce a bit. This is a mild curry but we didn't feel the need to add any extra chili, although you might want to if you like your curries on the spicy side. Quick as promised, again with a delicious sauce. Had some issues with my cherry tomatoes getting to a sauce-like consistency, solved by pressing down on them with a spoon. Served with basmati rice. The flavor of this was outstanding. I didn't really get the point of the parchment paper wrap other than to replace the flavor-providing banana leaf traditionally used. If the fish was supposed to steam a la "en papillote"- it didn't really do so. But this is so delicious- who cares!?! I had to cook the cod a bit longer than the recipe instructed because some pieces were quite thick. This was lovely and everyone enjoyed it. It didn't look like the photo though because the fish released a lot of steam while cooking, making the coating more watery. This was very good. I greatly reduced the salt (less than half), and it was plenty. The mustard seeds are very nice with the shrimp. This took under 30 minutes to make with most of the time spent prepping the shrimp. I did not have black mustard seeds so substituted brown. It was a good dish with garlic, butter, some heat from the chili, and the mustard flavor. I served over rice. Fast, easy and very nice. Very mild curry. Nice flavours, but far too salty as written. Next time I'll only use 1/4 tsp. Definitely needs the fresh chilli, I used hot chilli powder and it was quite mild. Also, double the tomatoes. This is really good. I was alarmed by the large volume of spinach leaves added to the pan. But I trusted Ms Sodha and the spinach wilted down to the perfect amount. (Mr lilham said he'd like more spinach in fact). This will be a regular in my house. This was great-not bitter at all, even though I slightly burned the onions. We used a beautiful big bag of spinach from the farmer's market, which ended up being only about half of the amount required, a 28 oz can of tomatoes (instead of fresh), and the optional green chile. I liked this. My husband thought it was okay. The kids barely ate it. We all prefer the coconut fish curry in this book. It is easier to prepare and, in my opinion, much tastier. I skipped the spice grinding part because I only had the ground versions and this threw off the flavoring a little. In the future, I will grind!. Otherwise an easy weeknight meal and a good way to get rid of an excess of eggs. This was interesting, but I don't know that I need to make it again. I'm never as much a fan of egg curries as I want to be. That said, I did like that the flavor combos were so new to me. It was all quite sweet. I agree with macfadden that the dish improves overnight. Immediately after making it, I thought it was just okay, but the leftovers were great. I think this dish benefits a lot from a night in the fridge. Not for me. A bit one dimensional and too sweet even without adding the sugar in the recipe. This curry was so sweet that it ended up being somewhat one-note. It's a must to pair it with a spicy pickle or chutney. Nothing earth-shattering here, but this does make a pretty tasty omelette! We halved the recipe for two people and each had half the omelette on a sandwich bun, with butter and sriracha. I'm normally not a ketchup fan, but I do think ketchup would be good here, as Sodha recommends in the headnote. Honestly, I found these instructions to completely change my rice making game. I love the addition of ghee! As others have noted, these instructions work well in producing an excellent pot of rice. I used half the recommended oil. This is a good, basic basmati rice to serve with a variety of Indian dishes. I think that in the future I will follow my usual method for cooking the rice, however, which is to turn off the burner and let the pot sit for 10 minutes after the initial 10 minute cooking period, then remove it from the burner and let it sit a final ten minutes before opening the pot and serving. Sodha's method doesn't include the 10 minute wait on the burner once it has been turned off, and the rice, while nicely cooked, was a little wet. I made this again, and this time it turned out perfectly. I let the onions get deeply brown, and left the rice on the burner for an additional ten minutes after the cooking time. Instead of a deep pot, I used a 12 inch sautee pan (I was doubling the recipe). In the end, the rice was perfectly cooked, and the onions had great, deep flavor. This is a good rice recipe, a bit different but not fussy to prepare. Like Rutabaga, I cooked this in a wide skillet, browned the onions and let it sit for ten minutes after turning off the heat and it was perfect. We loved this scented rice, which I served with the Ugandan curry. As noted, the cashews add lovely texture to the pilau. I roasted the cashews until lightly browned, which I would do again to enhance the cashew flavour. This is a really lovely pilau, very gently spiced and buttery. Mine did turn out slightly mushy, but that was my fault for using too much broth. When the rice has already soaked, it's important not to use any more stock than called for, and I find it's sometimes good to err on the low side, but in this case I forgot to do that. subtle but fragrant with a nice crunch from the cashews. this is a delicious way to cook basmati rice. I wish I had doubled the recipe. I didn't add dill, so in a sense I didn't really make this dish, although I followed the recipe otherwise in order to try this technique. The rice was pleasantly buttery and light, although mine was a little wet. Probably, I had added a little too much water, although it dried out pretty well while sitting in the open pot on the table. I cooked it for ten minutes as directed, then turned the heat off completely and left it on the burner for the next ten, and finally moved it to the table where it sat with the lid still on for another 5-10 minutes. While I like this dal, I found the flavor to be a little dull on its own, but that may just be the natural earthiness of chana dal, something that others may love. As adewar noted, I had to cook it for longer than 40 minutes, probably around 50-60 minutes total. Next time, I would use two large onions, as I loved the sweetness of the caramelized onion, and I would let the garlic brown more in the tarka, as my tarka was a little milder than I'd anticipated. We enjoyed mixing it with Sodha's tomato fry recipe; the bright tomato, lightly spicy tomatoes were a good match for the mellow dal. Delicious dal. I cooked the dal for a bit longer than than 40 minutes specified, otherwise followed the recipe to the letter and it was perfectly spiced and delicious! Like others, my dal took longer than the recipe specified- closer to 50-55 minutes. My family liked it and ate it without complaint but I didn't love it. The flavor was a bit bland and not nearly as good as the daily dal. We ate it with naan and the Gujarati potato curry but I think a tomato dish or greens would be a better accompaniment. This is one of my favourite dal's. It's always a hit when I make it. I usually accompany it with greens cooked with her child-garlic-ginger mix. I used a can of Muir diced tomatoes and it worked out well. I let it cook longer than instructed while I laid on the couch reading a book. It was delicious, especially when topped with the lightly spiced cabbage from the same book. My family liked this. I pureed it in and served it as a soup, with some lemon and yogurt as a garnish. Delicious! A tasty and relatively easy dal recipe. Definitely will make again. I added some spinach that needed used up. Beautiful lightly spiced dhal- lovely with chappatis. Delicious! I only felt it was missing some acidity, so I added some lemon to my bowl. I also added a tiny bit of water because I prefer a thinner dal. Last change, I included one seeded green chili because I wanted to use some up. (Finely chopped, added during second half of onion sautéing. ) This makes a huge pot of dal so I may halve the recipe in the future. I will definitely repeat this! This was a winner for us. As stated the recipe served 4 with a side salad. Very healthy and doable on a weeknight (about 50 minutes) as it is moderately hands off. The spicing was just right for us and the slow cooking of the onions is definitely key. My lentils took closer to 20 minutes and I did have to add a touch of water. Otherwise very good as written. I thought this dal was delicious. However, it took a little too long for a weeknight. Next time I would make entirely ahead and then reheat later. I was short on onion (could have used more) and ginger (reduced amount was fine) and used only 2 whole cloves. O refused to try it and E did not like it. Decent and satisfying dal. I thought the tomatoes threw it slightly off balance, wanted richer flavours, might brown the onions next time. This is a good solid dal recipe, but not as stellar as some of the other recipes I've tried so far in the book. I thought this was okay. I was happy to finish a bowl but do not feel inclined to make it again. I wanted more spice/flavor/complexity. I'm so glad I tried this one. Even my husband, not usually a lentil fan, enjoyed it and had seconds. It's wonderfully creamy and comforting, although I admit I added a little extra cream myself. I made only half the recipe, and found it feeds four people quite generously. Fortunately, I read through the recipe the night before, which made me realize that I needed to start soaking the lentils that same night, then cook the lentils most of the way in the morning in order to have them ready for dinner that night after returning home from work. This schedule works well, though, as the lentils benefit from a long rest that allows the flavors to mingle. This was the most effort to lowest reward recipe in the book. If I make them again, I will use a pressure cooker. Deceptively simple, but I agree that the cinnamon really adds something extra. Served with garlic naan, yogurt, and some leftover tomato chutney from this book. This was delicious. It is one of my favorite recipes from this book so far. The cinnamon gives the dish an unexpected flavor that really makes it something special. We ate it with naan instead of rice (along with aloo gobi). It was especially delicious with some raita and mango chutney! I made this with canned kidney beans and halved the recipe. Loved it! I made this with canned chick peas. While it was good, it didn't blow me out of the water. I felt like something was missing. I added a bit of sugar and lime to try and add some depth. Easy weeknight dinner - used tinned chickpeas and served with fluffy rice and yoghurt. Mild flavour but just interesting enough. Really loved this. I used dried chickepas and halved the salt used. This was good, but I've had chana masalas that I've enjoyed more. I used dried chickpeas. I wanted a bit more of the tomato sauce; my final dish was a bit dry and I had to add a little water. If you started with canned chickpeas, this would be a very quick weeknight dish. This is a good, basic vegetarian curry that would complement any number of other Indian dishes. I used dried chickpeas, which, while tender, had a nice, firm bite. I could see dressing this dish up with a little sour lime or tamarind, but I served it alongside Sodha's 100 garlic-clove curry, and found those two dishes to be an excellent pairing. As a chickpea fiend I was predisposed to love this and it didn’t disappoint. Great heat balance, slightly crunchy onions for texture, rich finish. Served with thick cut lamb loin chops, could have used a sauce for the lamb to tie it together, like a yogurt sauce or a mint of coriander chutney. These "fries" are pretty tasty. I used Madras curry powder, as it's not too spicy for young palates. I enjoyed them with tamarind date chutney, but my husband and son preferred the usual ketchup. Everyone loved these so they'll be made again. I served them with the royal Bengal fish fingers. I also liked these, especially how crispy they turned out. Also served with the spicy lamb burgers. These are a great accompaniment to the lamb burgers. Since Sodha says to cut these into "your preferred fry shape," I ended up cutting them quite thin, since that's what we like. I should have decreased the boiling time slightly to account for this. Mine also ended up taking longer than 25 min in the oven to get nice and crisp, but once again, I think that's my fault since I tried to fit them all on one large baking sheet. Next time I'll keep my nice thin fry size, but boil for 1 min less, dry them very thoroughly, and spread them out onto two baking sheets to roast. Otherwise, this is a delicious recipe and I loved the final toss in some spices. I used whole cumin seeds and crushed them a bit myself, which I prefer to pre-ground cumin, and I'd do it that way again. Excellent accompaniment to the spicy lamb burgers. Very flavourful, will definitely make again. Excellent recipe, a perfect accompaniment to the whole roast masala chickens. The ground peanuts added another dimension. Made for our dinner party for two vegan friends. How can you go wrong with fried potatoes? These were delicious and looked very pretty with all their garnishes--I set the whole tray of them out on the table, and they were gone before dinner was over. A resounding hit and I would love to try these with Sodha's Masala Chicken, like she recommends. These potatoes were well received, but I would recommend adding salt slowly and to taste rather than dumping in the amount she recommends. These things are a matter of taste, of course, but I thought it was way too much salt and had to try to scrape all the salt on the bottom of the pan to one corner and get it out of the pan. I cut the potatoes a bit smaller than it said so they would cook in a reasonable amount of time, but otherwise followed the recipe. 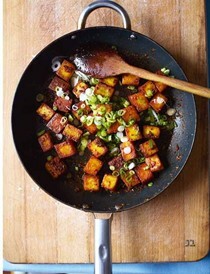 This is sauté potatoes with an Indian twist. Mr Lilham and I thought they were the best we had. I served this with the middle eastern lentils from Diana Henry's Cook Simple. They worked very well together. Not much else to add to the other reviews, but we loved these too. I served them with the Masala Chicken and kale, and I have to say, I didn't like the combination with the chicken (though I very much liked it with the kale). I thought the chicken and potatoes were too dry together. I like the idea of trying these with lentils like Lilham suggests. This is going to be my new go-to raita, it gives such a wonderful garlicy punch to your meal. I served this coconut tamarind chicken curry. It was ok, nothing special. The spinach gives off a lot of water that dilutes the taste of the butter, garlic,lemon and pepper. Don't think I will make this one again. Not a fan of this. I prefer a simple stir fried spinach with garlic and chilli, without the lemon juice. I used tenderstem broccoli instead of green beans. I served this as a side to the workers' curry in the same book. So easy and so good. Super fast and flavorful, this is a great green bean dish that can be paired with almost any kind of meal. I thought this was delicious for such a simple dish. I made half a recipe and used regular green beans. It took maybe 15 minutes from start to finish. It will definitely be repeated. I need to buy a splatter screen for this dish. The sesame seeds were popping high and out of the pan. My stove is covered in toasted sesame seeds. Great way to jazz up green beans. The ginger really gave them an edge but I couldn't really taste the mustard seeds. Served with the whole masala chicken with Ferrari potatoes. I used regular green beans and kind of wish I'd used haricot vert instead, but the flavor of these were pretty good. Would be an easy side to a curry or something. Also I like the idea of using broccoli instead of green beans! Might try that next time. Simple to prepare and perfect for serving with any Indian curry dish, but particularly to brighten the plate and give something fresh and contrasting. Simple and delicious- served as an accompaniment to the naans and roasted cauliflower from the same book- worked brilliantly, but could work with any number of Indian dishes. A light refreshing slaw with a good balance of sweet, sour and salt. I needed nearly double the amount of dressing than the recipe. I made this slaw using a pack of slaw mix (cabbage carrots & beets I think). And that could have contributed to my not loving it. I also needed more dressing than was called for, but was out of limes so had to do without. I felt the balance was off but that could have been the result of my alterations. Very colourful, crunchy and packed with fresh flavours. A good accompaniment to chicken tikka or curries. I could not find mooli and used another kind of radish instead. I put everything into a ziplock bag and tossed it that way, because it is difficult to do in a bowl. Really fresh and delicious. This recipe makes a TON of slaw, but it does keep well for a few days, so no complaints. Made this without the amchur and enjoyed it. This was good, but could have used some more generous seasoning. This is a very tasty recipe. We thought this cauliflower recipe was exceptional. The cauliflower is parboiled for one minute and this renders a very tender cauliflower. I halved the chili so it wouldn't be too hot for the kids but otherwise followed the recipe. This will be added to our frequent rotation! Yields perfectly browned, tender, flavourful cauliflower. An all purpose side. Another winner from this book. Full of flavour and easy to prepare. This is a nice, mildly flavored vegetable side (unless you want to amp up the chile powder, but I kept it mild for the kids). Roasted cauliflower is always good in my book, and this was no exception. However, I don't think it's necessary to blanch the cauliflower prior to roasting. I may have let mine boil a minute too long, because it never really crisped up in the oven. Next time, I'll either skip this step, or be sure to drain it more promptly. It's a very handy side dish to serve with an Indian meal, since it bakes in the oven while a pot of rice and another pan of curry simmer away on the stovetop. What a lovely accompaniment! This made for wonderful crisp little cauliflower flavour bombs to add any meal. These would even work alone with naan and katchumber/ raita. We absolutely loved this salad. I replaced the pomegranate seeds with half of a really ripe Ataulfo mango (for a half recipe), and that gave a nice sweet/tart hit to the salad. Will definitely be making this again-I think it would be good for a family dinner/potluck. I love, love, love this and so has everyone I've served it to. So easy and so aromatic, and pretty at the same time. It takes a while to chop everything, but well worth it. Some green asparagus fits in well, too. Delicious! WE especially loved the chickpeas. I might try mango next time, as my husband hates pomegranate. A great salad. Very tasty & incredibly easy to prepare. Highly recommend. I made these using chapatti flour and served them with coconut tamarind chicken curry. They turned out really well! I appreciated the precise instructions. Once I got into the routine of making them, I was even able to squeeze in a sip of wine between chapattis! Would make these again. Although I have a stand mixer, I mixed it by hand. They were a success. Family loved them so here we go another thing to make.I served it with mums curry. Very successful - I made the dough in the stand mixer. I made these with the mix of whole wheat and white flour that Sodha recommends if you don't have chapatti flour. I even included some whole wheat pastry flour, since I ran out of white. These came together very quickly - I didn't even use the mixer - and roll out easily. We ate them in a very un-Indian way, filled with sauteed chickpeas with roasted red peppers, smoked paprika, spinach, and goat cheese. Similar to tortillas, these are delicious hot off the pan. Leftovers definitely taste best when reheated. My first time making chapattis. The instructions were clear although I wish I had a stand mixer to make the whole process easier. I was also of maybe trying this with a tortilla press (not sure if that's blasphemous). This naan had a nice flavor, but it didn't puff up when cooking or have quite as much "chew" as I was hoping. Maybe kneading it a few extra minutes would do the trick, or letting it rise longer (our house was fairly cool, so even after two hours, the dough had barely doubled). It was still good, and a recipe I want to try again. It's very easy, and I like cooking the bread in a skillet, like tortillas (just be careful not to let it burn and scorch the pan). I haven't made naan before, but this recipe worked amazing. The dough was easy to roll out, it puffed when cooking (follow the method in the book and it should happen!) and it tastes amazing!!!! Love it. Amazing - even my partner asked how I managed to create this! I think that the arrival of this book means that we won't be having take away Indian again for a long time! I kneaded the dough by hand before leaving to prove near the oven - my kitchen was nice and warm due to slow roasting lamb cooking away. This worked perfectly in a dry pan and the naan were soft and puffed up. Easy enough to have two pans cooking at the same time. I added a light coating of garlic butter. very good and easy to follow recipe for Naan - not quite as puffy and moist and chewy as the recipe I used from Aarti Paarti but people were surprised that the bread was homemade - it looked perfect. I brushed the hot bread with melted butter and hubby would have liked some garlic - next time. Great naan. Puffed up beautifully. I made the dough in the morning to rise through the day- worked perfectly. Can be frozen and stays soft if wrapped till the next day. Replaced the raisins with grated apple- fabulous recipe, takeaway quality naans, in hardly any time at all! This is an excellent cilantro chutney. I never would have expected peanuts as an ingredient here, but it really balances the cilantro without making it taste overly of peanuts. My husband loved the tang that the lemon juice provided. This chutney is delicious. Perfect accompaniment to her samosas. I would consider making it in my mortar and pestle next time as I had a really difficult time blending it. very simple yet very delicious meal. The cilantro chutney gives is grassy lemony flavour with some hear and I enjoyed the caramelized onions on top. Make sure you blend the dates first. I didn't need to add any water but I prefer it a bit thicker. Sometimes I add a squeeze of lemon or lime to give it a bit more depth. This is a great accompaniment to Soda's masala potatoes. It's also very quick to make. I would start with fewer dates next time, as I found it too sweet when made as written, and had to add a lot more tamarind to balance the flavors. Perhaps my dates were just exceptionally sweet. This was a delicious chutney with a nice balance of sweet and tangy. I did need to add quite a bit of water to get it to puree into a nice sauce. Fantastic flavour, we loved this but too hot for the 9yr old. Served with the spicy lamb burgers and masala fries from the same book. My batch didn't turn out very spicy, but might just have been the jalapeno that I used. I used cherry tomatoes, so there were lots of skins left in that I would also remove next time, or just use canned tomatoes. Yum! Loved this with the lamb burger and masala fries--we used it both as a spread on the burger and as a dip for the fries. It is fairly spicy--we used a jalapeno, which I seeded to be safe, and it still had a good amount of kick. I used quartered plum tomatoes and fished out their peels as they cooked down, to produce a smoother final texture. I imagine this would work great with canned tomatoes too. I have some left over that I'm eager to try on fried eggs. Delicious! Great flavours- but the tomato skins are better removed. Fabulous even made with Italian canned peeled tomatoes. I served it with the chicken samosas. I made a less spicy version of this chutney. Perhaps because it didn't have the heat to balance the flavors, we found it a little too sweet. I would start with only half the sugar called for next time, then add more to taste if needed. The flavor was terrific otherwise. YUM! Will definitely make this again and not just to accompany the spicy lamb burgers, however I will be removing the tomato skins next time. Quick and easy to make and very tasty. Went well with the roasted tamarind chicken recipe from the same book, but would work with so many other things too. Delicious, though my green chile (jalapeño) was hotter than anticipated, which took away some of the mint flavor. Although the recipe says this can be eaten right away, the flavor improves and blends if made in advance. I cheated and made this with cilantro rather than mint, and thoroughly enjoyed it (although I will try it with mint in the future). My chili was extremely spicy, though, although luckily the spiciness mellowed the longer the chutney sat. So easy and versatile! We made these to go with a Moroccan chicken/chickpea braise and they were such a nice, refreshing addition. I could see these being very tasty on a lot of different things--will definitely make again. Very simple but the zingy pink onions are great on top of a curry to provide a flavour hit. My love affair with this book continues...these balls of fudge are amazingly easy to make and impressive to look at. They would look great on a contrasting colour plate and served with after dinner coffees. We loved these and our dinner guests did as well. I'd recommend dipping in melted dark chocolate as Meera does for her grandma. I only dipped about half of the ball and it was perfect. I might give these candies out as holiday gifts this year. Works great in popsicle molds! Highly recommend a spice/coffee grinder for the ground pistachios. Super easy - if you can make ricotta, you can make this. I keep a jar of this ready in my cupboard. I don't follow the author's instruction on p260 to make the chai masala. Instead I put a tea bag in mug, brew, then add my milk, sugar and a 1/4 tsp of this spice mix. Absolutely delicious and a nice change of pace from our normal, Asian-inspired fried rices. This is a really great recipe to have on hand because most of the ingredients are pantry staples for us. We had some leftover takeout crab curry which I used as the base of the dish. The result was so bright and flavorful from the extra spices and squeeze of lemon, which really makes the dish. I imagine this fried rice treatment would still be delicious without any leftover curry, as well. It's nice to try fried rice with a little bit of Indian flavor for a change. Like most basic fried rice recipes, this one is very versatile, and if you have leftover rice it's highly likely you already have all the other ingredients called for. Cooking the rice on moderately low heat with the lid on yielded very good results without any problematic sticking to the pan. Frozen peas are perfect here, as they will still be bright green when the dish is done. Like TrishaCP I found this curry to be a bit bland. Some improvement with more sugar, turmeric and salt; I think it needs more garlic, ginger and tamarind. Might double the latter next time. Oh, my goodness. I think I've found a new favorite curry from this book. This was so delicious! Unlike the below comments, I found the flavor to be perfect here, and I think it has something to do with the fact that my aromatics caramelized for a long time while I sliced up the chicken. So next time I'd let them do the same thing. I also simmered the whole curry mixture for a bit longer than 15 minutes, and cracked the lid for a while to reduce the sauce a bit. The leftovers had an even better, more developed flavor. The only thing I may like a bit more of next time is the tamarind paste. Otherwise, I'm really obsessed with how good this was, and I'll definitely make it again. This was too bland for my family's taste. I have to agree with the other comments that an increase in ginger, chilies, tamarind might help it. Overall easy meal to make but was disappointed in flavor. Very simple curry that comes together quickly. Lovely flavours - tastes like it took much longer to make than 30 minutes! This is my first recipe from this book and I'm definitely looking forward to making more. This was just ok for me, though my husband liked it quite a bit. I just felt the flavors needed amplification- more garlic, ginger, chiles and tamarind. I would definitely play around with increasing those flavors were I to make this again. Unlike the other reviewers, I did not find this bland - I actually think the taste of the curry leaves was too much for me, so I'll decrease them in the future. (Maybe mine are bigger than the ones she is calling for.) This is a good pantry-style dish, even though I had to use chicken breast instead of chicken thigh. As with the other curry in this book, I found that I don't like the sliced onions in this, so I think I will chop them in the future and I may also explore adding a vegetable or two to the dish. This was definitely a solid recipe, though, especially for ingredients I almost always have lying around. 1-25-2018 Have made this with tofu instead of chicken several times now. I fry the tofu first. I use panch puran (pickling spice mixture) instead of measuring the individual spices. List of 10 recipes from the book most praised by Food52 members. Picked for Food52's October 2017 Cookbook Club. Interview with author-Meera Sodha wants to change the way you think about Indian food. ...the recipes are extraordinary. Curries, chutneys, chaat, and more—plus soups and desserts—are all here, structured clearly and in an ideal progression for the home cook. ...chronicles the sort of Indian cooking her family makes at home: fresh, speedy, vibrantly flavored, and far truer to the reality of Indian home cooking than the tikka masala at your average takeout. The best Indian food is cooked (and eaten) at home. Real Indian food is fresh, simple and packed with flavour and in this book, Meera Sodha introduces Britain to the food she grew up eating here every day. Unlike the stuff you get at your local curry house, her food is fresh, vibrant and surprisingly quick and easy to make. In this collection, Meera serves up a feast of over 130 delicious recipes collected from three generations of her family: there's everything from hot chappatis to street food (chilli paneer and beetroot and feta samosas), fragrant curries (spinach and salmon or perfect cinnamon lamb curry), to colourful side dishes (pomegranate and mint raita, kachumbar salad), and mouth-watering puddings (mango, lime and passion fruit jelly and pistachio and saffron kulfi). Made in India will change the way you cook, eat, and think about Indian food, forever.